Happy Monday from Omaha! I'm back from a two-week jaunt visiting my parents in Utah (catch up over on my Instagram). I didn't do a ton of shopping while I was there, but I did stop by Ulta late last week to use a birthday coupon. The Ulta I went to had a few brands the stores here in Omaha don't carry, so I did some extra swatching and looking around . . . and then green lipstick caught my eye. Lipstick Queen's Frog Prince Lipstick was quite hyped about a while ago, and I'd wanted to try it but couldn't get my hands on it in-person. 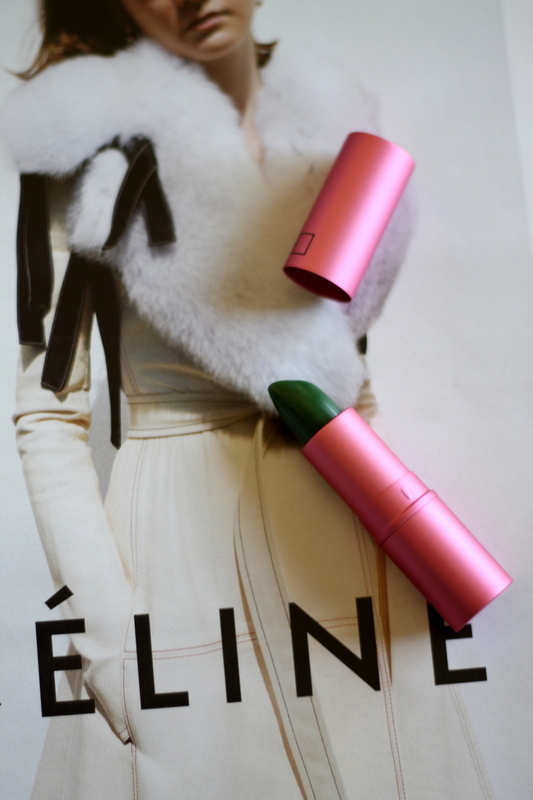 The lipstick doesn't apply green; it morphs into a shade of pink based on your skin's pH. I swatched it on my hand in Ulta and it transformed into a dark, berry-like pink. When I brought it back and applied it to my lips, the same color popped up (and bonus—it's very moisturizing and somewhat sheer). But when my roommate tried it on, it applied an almost cherry-like red on her. Science, people!